Clearing cycle of all the connected platforms. Wheel weighing multi scale functioning mode, with up to 16 connectable 350-Ohm load cells and up to 4 independent reading channels available (for 4 platforms). Static axle weighing functioning mode, up to 2 reading channels, with manual acquisition of the weight of each axle through dedicated key. Calculation of the x and y coordinates of the centre of gravity (for wheel weighing mode). Cancellation of the last weigh made. 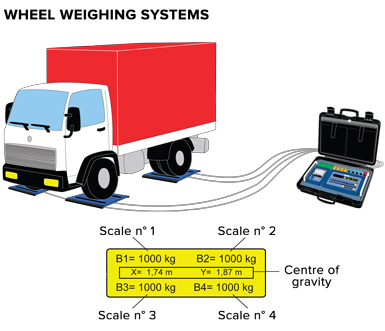 Quick selection of the number of active reading channels of the weight (up to 4, independent), for configuring the instrument depending on the number of resting points of the vehicle to be weighed. Semi-automatic tare (for wheel weighing mode). Presettable tare, subtracted from the sum weight of the single wheels in the wheel-weighing mode or from the total weight of the vehicle in the axle-weighing mode. Selection of displayed data on the graphic LCD display (totals, progressives, weight…). Simultaneous display of the weight on each platform (up to 4 independent channels) and of the total weight. Thanks to the 3590EKR series indicator combined with a radio module, it is possible to manage up to 16 WWSRF platforms fitted with built-in radio module, with database management and calculation of the center of gravity. Completely configurable keyboard functions according to the customers’ needs. 15 configurable and printable text ID`s containing 32 characters, for example: Code, lot ID, operator ID, shift number, etc. Database of 1000 storages, with programmable modification password, each composed of 5 alphanumeric descriptions, for vehicle, client, or material management. Programmable printout from keyboard or from PC (through the free Dinitools.net software) of 30 print formats linkable to various functions; each print format may contain up to 2048 positions which may be ASCII codes or preconfigured print blocks (i.e. Company name, weight of each platform or axle, total weight, centre of gravity coordinates, etc.). 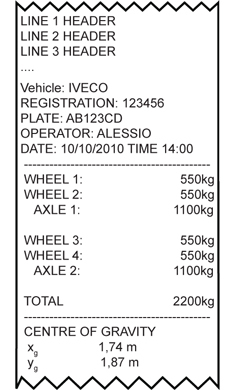 Alibi memory for automatic storage of the total weight of the vehicle (only for wheel-weighing mode). Print and display list of last 3500 vehicles (in wheel weighing mode) or 3500 axles (in axle weighing mode), with possibility of cancellation. - The wheel weighing systems, with a number of platforms equal to the number of vehicle's wheels, are approved, because the weight of the vehicle is determined in only one weigh. - The axle weighing systems are for internal use only.